Did Cartoon Tiamat’s Design Influence the Look of Modern Dragons? If you are reading this blog, you are undoubtedly a fan of both dungeons and dragons. While dangerous trips to underground caverns and cellars filled with treasure and strange creatures are great, I have always found the dragon part of the game’s title the most interesting. I love all the different varieties of dragons, their breath weapons, personality quirks, just about everything about them. Tiamat, as the biggest, baddest dragon of all, has always been a favorite of mine. I was spellbound by her representation in the D&D cartoon (which I gushed over once before here). When you are nine years old, a giant five headed dragon is about as cool as it gets. When I was older, I enjoyed Takhisis from the Dragonlance saga, as well. Elmore and Easley were my favorite artists back in the day, largely because they really knew how to paint my favorite reptilian villains. When I got back into D&D last year, one of the first things that struck me was how different the five types of chromatic dragons were from one another. Other than size and color, there really weren’t many physical differences between the varieties in old school D&D. These days, each breed has traits that make them unique, like the skull-faced blacks and the horn-crested blue. I love this, as it makes the different types feel much different from one another. 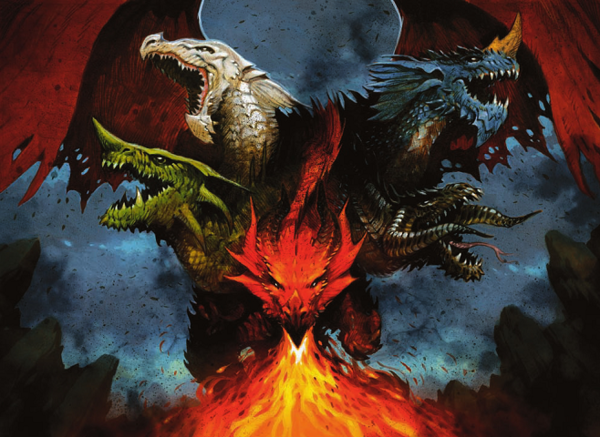 As I perused the different miniatures, flipped through the Draconomicon, and looked at images online, I somehow found the modern look of dragons to be familiar. Recently, I watched an episode of the D&D cartoon again, and a light bulb went off in my mind. 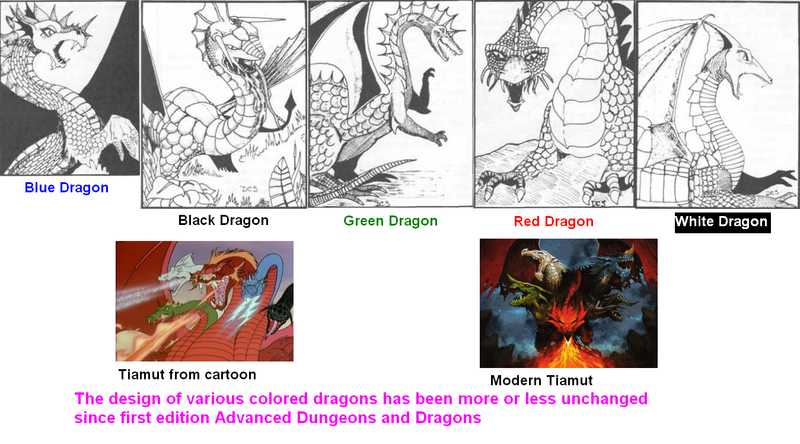 The “house style” for modern dragons looks to have been inspired by the iconic presentation of Tiamat in the cartoon. It’s not an exact match, but there are a few similarities that are so obvious, I can’t help but think they are intentional. I was unable to find anything about the subject online, so I decided to use my elite MS Paint skills to compare the cartoon and modern versions more directly. Using graphics from the official Wizards site, as well as crops from the image of cartoon Tiamat above, I was able to place the old and new versions of each chromatic dragon side by side. You might be surprised by how similar the two are! We’ll start with the smallest type of dragon, one that has been partnered with frost giants in adventures since D&D began: the white dragon. In this case, the similarities between the cartoon and the modern dragon are striking. The finned crest at the top of the head is almost exactly the same between the two. It’s very distinctive. In both versions, the white dragon is rather plain in appearance, without any horns or spikes to speak of, compared with the more colorful breeds. Next we come to the black dragon, dweller of swamps and bogs. The modern black dragon has a unique skull-like face, far different from its modern companions. While the cartoon dragon’s face doesn’t share that same shape, it is similarly shortened, with a higher nose, like the modern. The flat shape of the head is unique to the black in both the cartoon and modern versions. Most especially, the signature downward curved horns are the same between the two. Overall, the black dragons are one of the closer matches. A step up in size, we find the green dragon, well-known for being sneaky and cunning. Here, the similarities between the two are not quite as evident. The cartoon green has a series of spikes down the back of its neck, as does the modern version. But the webbing between the spikes is missing in the modern green. Conspicuously absent from the cartoon green are the prominent nose horn and cheek spikes of the modern. I suppose one could argue that both have a bumpy, elongated snout, but that’s really stretching it. The mighty blue dragon, with its lightning breath weapon, is next on our list. Here, perhaps, are the most obvious shared characteristics. The cartoon blue is the only one with a nose horn, and this feature is mirrored in the modern blue’s large forehead horn, though the location is slightly different. A row of spikes down the back of the neck is another common feature. The large spiky flaps on the ear area of the modern blue are reminiscent of the cartoon’s webbed fins. The blue dragons probably have the strongest correlations between the cartoon and the modern version. The largest, most powerful dragon breed, the magnificent red, is a fitting end to this little study. Unfortunately, the cartoon and modern red dragons have very little in common. I always thought the cartoon red had an almost Oriental-style look to it, more lion-like than reptilian, very much unlike Tiamat’s other heads. Thus, there only a few similarities between the two, and they are far less specific. The orange, hair-like spots on the neck and cheeks are vaguely similar to the fins and spikes on the modern dragon. The prominent eye ridges on the cartoon red are perhaps indicative of the regal horns of the modern counterpart. But overall, the modern red looks more like its newer brethren than it does the cartoon red. Disappointing, for the purposes of this post, but nonetheless true. The final tally, then, looks something like this. The blue and black dragons are very unique in the cartoon, and their modern equivalents share many of the same attributes, like the black’s downward facing horns and the blue’s large horn crest. The white dragons are not as close a match, but still very much alike; the green is only vaguely similar. The red dragon in the cartoon is wildly different from the others, and shares only a passing resemblance to the modern equivalent. If this were school, I’d grade the similarities as two As, a B+, a C, and a D- (passing only because I don’t want a mad red dragon parent after me). That averages out to a B-, which I’d say is a fairly strong correlation. 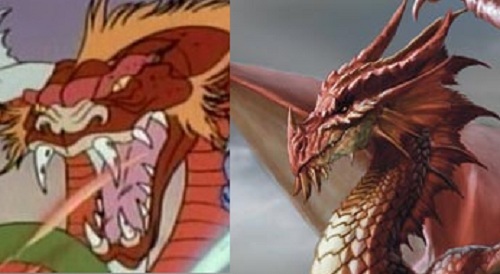 Maybe I am just totally off here, but I think it is clear that the artists who designed the look of modern dragons were influenced by the design of Tiamat in the cartoon. Perhaps this was intentional, as a sort of nod to the past, or perhaps it was subconscious. It might even have been a bald-faced coincidence. Whatever the case, taking a look at this has been very interesting for me, and hopefully for you as well. What do you think? This entry was posted in D&D, Dungeons & Dragons, Roleplaying and tagged D&D Cartoon. Bookmark the permalink. 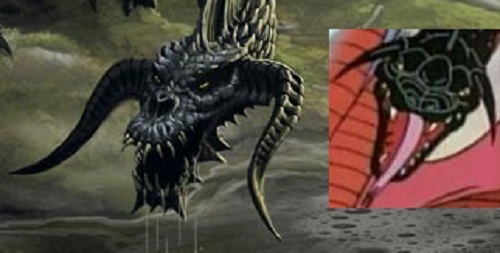 10 Responses to Did Cartoon Tiamat’s Design Influence the Look of Modern Dragons? The cartoon came after the AD&D Monster Manual, and matches the images in there pretty well. Which is to say that everything is basically canon and just evolving slightly (I love how the thorn-like spikes on the sides of the black dragon’s head turn into curved horns). I disagree with your assessment of the Red. I don’t think you give the “hair tufts” on the cheeks and down the back of the neck enough credit for being the source for the cheek spikes/fins and crest running down the neck of the modern. I also think that the brow horns are a carry-over of the brows on the cartoon. Backing up Teos on this — the design looks the same because…the design has always been that way. White dragons have always had fins, black dragons have always had forward-facing horns, green dragons have also always had fins, blue dragons have always had a nose spike, and..well red dragons changed significantly but they looked rather tiger-like in the original format. The new red dragon design is much more dragonish, in my opinion. In other news: Dungeons and Dragons bases Wizard class off of strange “Presto” character from animated series. Great comparison and one I don’t think anyone has stumbled upon before. I certainly haven’t ever noticed it or had it pointed out to me. I remember each dragon type in my AD&D Monstrous Manual looking quite separate and distinct though. I’m sure there are images out there in the great tome of Google Image search, but I’m not diving into it right now! 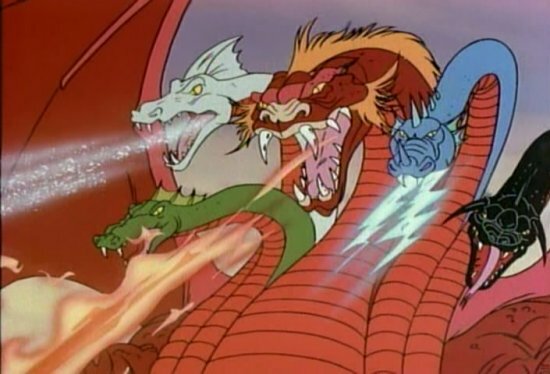 It makes sense that cartoon Tiamat looks like the AD&D Monster Manual designs. I don’t have a copy of that handy right now, and can’t find any images online, but I’m sure that this is the case. Thanks for pointing this out, and please forgive my ignorance; coming into the hobby through Basic D&D, I didn’t recall the original look. In any case, by the mid 80s, this look had largely been abandoned. Caldwell, Elmore, and Easley, three of the most prolific TSR artists of the time, seemed to have their own interpretations of what each dragon looked like. These looks were quite different than what came before. Look at the covers to the original Dragonlance modules, for instance. The dragon types on those are far less distinct from one another, and vary quite a bit from artist to artist. Larry Elmore’s green dragons look totally different than Clyde Caldwell’s, for instance. In the past few years, D&D is back to a common style again, where dragons look pretty much alike no matter who is illustrating them. Each color is quite distinctive, and easily defined, far less generic than the middle era. The fact that the modern look goes back even farther than I thought, all the way back to the original Monster Manual, feels very right. I got a tour of Wizards once, during the runup to 3e. 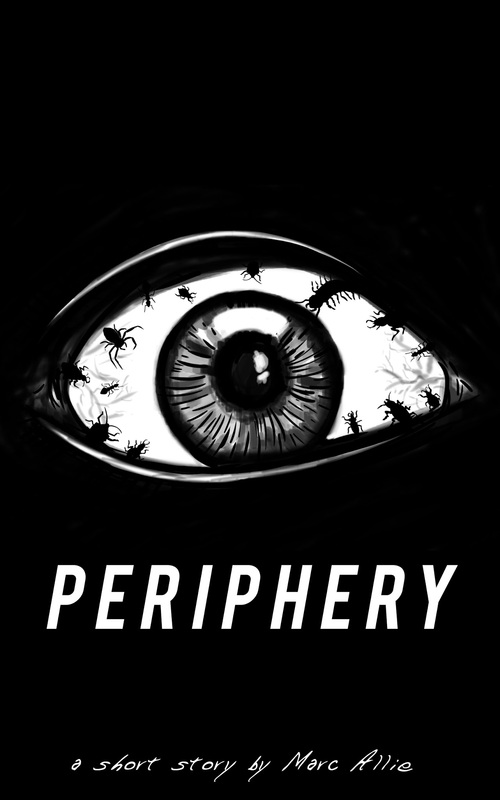 I talked to an artist who was working on monster designs. She told me Wizards was conciously designing each dragon type to have a specific look, so that a D&D dragon wasn’t just any dragon. Legal issues were part of this—they wanted their dragons to be copyrighted.